All throughout the Bible, God is seen as being a promoter of strong family relationships and from the beginning, these families would start with the marriage of a man and a woman. This is and was God’s one and only design for an intimate relationship and to fulfill the commandment to be fruitful and multiply (Genesis 1:28). Is there anything sweeter than the absolute unity of true togetherness? Togetherness that’s not shackled by doubts, mistrust, etc.? Togetherness that speaks more in action than words and says, in this relationship, we come together to share life together? Her concerns become his concerns, and vice versa. She feels what he feels because their bond is one of unity and selfless love. Yes, I believe in the beginning, before sin entered the picture, that sweetness existed. And, that’s just how God intended it to be. After the man was created, he was alone and had no one else like himself to share life with. The animals were great and served as some source of possible companionship, but they could never fulfill the needs of the man the way someone like him would. Animals are wonderful, and I’m an animal lover, but animals are not people. People need people. Humans need other humans to love and interact with to be whole and complete. There is something integral missing in the created man’s life and God set about to remedy that situation when He made a help meet for Adam. This lesson opens with, And the LORD God said, verifying that God Himself is the one making the statement that follows. This is critical because it’s not only stating God’s authorship of the words but also in the actions that follow. It is not good that the man should be alone. At the end of everything God created He said, “It was good,” (Genesis 1:31). But, here in this verse, something causes God to say, it is not good. And that something is the loneliness of man, which we are assuming is the present cause for concern. This verse specifically points out the man using a singular stance, meaning just one. The usage of the words like this reemphasizes the power behind God’s statement of his [the man] being alone. Think about that word alone for a minute. It can evoke a sense of isolation even though one is not in isolation physically. Adam was in a big, beautiful garden, but he was alone. He was surrounded by other living creatures, yet, he was still alone. In all of that, we get the sense that Adam longed for more. Was Adam feeling unfilled? Viewing the monkeys swinging in the trees together as a community or rabbits chasing each other in a game of bunny tag, did the sight dishearten Adam and make him long for more? We don’t know. All we do know is what Scripture tells us, and that is, man is alone and in God’s eyes, it was not good. Adam could talk, but he had nobody like himself to converse with on a daily basis. Adam could feel, but he had nobody like himself to share his feelings with. Adam could embrace, but another set of arms to embrace him back was missing. What was all of this doing to him on the inside? Again, we don’t know. But, for the man God created, I can imagine He did not want to see any despondency in Adam due to being alone. So, God sought to remedy the situation. Note: Yes, Adam could converse with God and share his daily concerns with God, but we are talking about the absence of another physical being like himself on the earth to share life with. And, when we are thinking along those lines of questioning, remember it was God Himself who pointed out Adam’s aloneness and said it was not good. Therefore, we cannot argue with God. I will make him an help meet for him. God has something special up his sleeve. All that He created was good. Every creature, the way He made them was perfect, but God was going to do something special for Adam. God was going to bless him with a mate, a companion; someone whom he could share this life journey with. God was going to fill that not good part of Adam’s life with something not only good but specially made just for him. With His marvelous creative abilities, God said, I will make, or, I will design someone who can specifically fill that void He sees in Adam’s life. How awesome is that! The Bible goes into great detail to show us God’s love and care for the man, to the point of fashioning for him someone that can meet his needs on every relational level. One that is appropriate and compatible just for him. And out of the ground the LORD God formed every beast… and fowl. Here is a reiteration of what already occurred. There are no contradictions in the Bible. A good Bible student will see the wording for what it is, a supportive summary of creation and continually pointing back to God as the Creator is necessary and we could never over-emphasize it enough. Perhaps that’s why the psalmist rejoiced when he thought about it and celebrated God for it when he states, “O LORD, how manifold are thy works! in wisdom thou made them all…” (Psalm 104:24; emphasis mine). Out of all those manifold works, we see here where it is stated again that the Lord made these animals as well. And, if we remember, when God made Adam, he was brought forth from the “dust of the ground,” (Genesis 2:7). These reiterations of the Creation story, specifically toward living creatures, not only supports the story of the Author of Creation, but it also sets apart that special way that God takes that not good and turns it into something good (we will discuss this further in the next section). And brought them unto Adam to see what he would call them: and whatsoever Adam called every living creature, that was the name thereof. Genesis 2:15 says, “And the Lord God took the man, and put him into the garden of Eden to dress it and to keep it.” I have always looked upon that verse and the verse in our lesson with the name of every living creature as jobs that were given to Adam by God. And notice, these jobs were given before the Fall of man, before sin entered the world. A lot of people try to distinguish why Adam was responsible for the naming of the living creatures at this meet and greet with the animals and not God. God could’ve done it all, and yet, God has always invited mankind to participate in what He is doing. God has never promoted laziness but has always encouraged mankind in taking on responsibility. I think it is amazing how God is allowing Adam to work at, or speak things, as He Himself does. He is not speaking things into creation, but he is speaking names over it and whatever Adam speaks, whatever he calls them, that was the name thereof, and God ordained it to be so. I believe (just my opinion), that when one works at something, be it dressing a garden or naming creatures or the like, there becomes more interest and more personal involvement compelling one to invest in the care of what God already created. With that, Adam gave names to all. God’s observation in verse 18 begins to stand out even more in verse 20 where it states, but for Adam there was not found an help meet for him. After naming the animals, was it now apparent, or more apparent to Adam himself that there just was no one else like him? Again, we don’t know, but what we do know is that the reiteration of this point means that God wanted it especially noted and referenced. 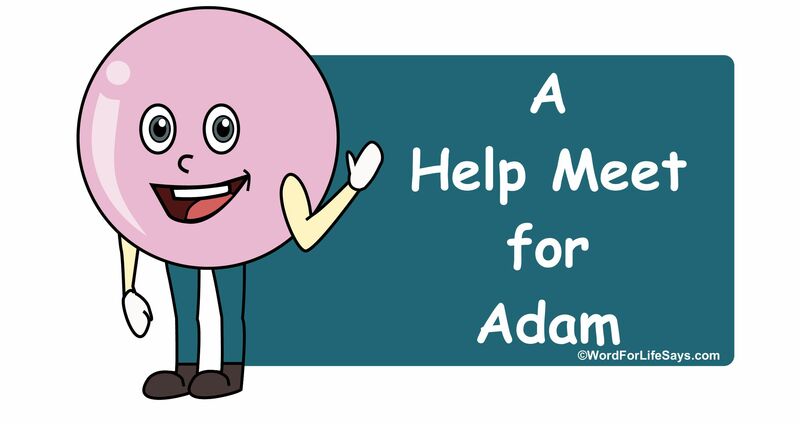 Twice in this lesson, the need for a help meet appropriate for Adam is implied and stated. Twice we sense that deep longing for companionship. Twice we see Adam didn’t have anybody to relate to on his level. These are all things that can be associated with the not good that God stated at the beginning of this lesson. Nevertheless, God is getting ready to take that not good, and make something good. And the LORD God caused a deep sleep to fall upon Adam, and he slept. It was time for the first human surgery to commence. This was not done by doctors in the medical field who have piled on degrees to learn about the human body. This was done by Him who created the human body from the mere dust of the ground. Using the first case of anesthesia, Adam slept. As with modern day anesthesia he was completely under, knocked out, and totally unconscious. This was done that God might create the help meet he needed as a companion, and He was going to do this in a special way. Taking one of Adam’s ribs, God made he a woman, and brought her unto the man.” Why did God decide to make Eve in a different way than He did Adam? There’s a lot of speculation with no definitive answer. 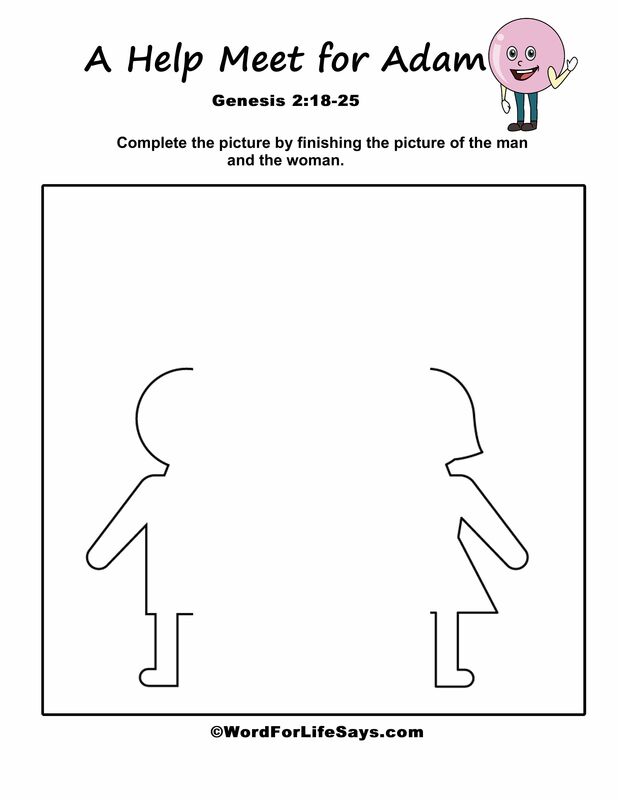 All we know is God left a very detailed and illustrated version of Eve coming into existence differently than Adam. Then, God brought her unto the man. As a gift most precious, the woman was presented to the man from God. In his eyes, she was definitely something good to behold as the next verses suggest. Adam’s reaction when he saw Eve was priceless! “This is now bone of my bones, and flesh of my flesh,” he exclaimed. Some way or another, Adam was made aware of the procedure that transpired and when he saw the woman he immediately recognized her as being the result of that procedure; her as being from him. Adam’s declaration is she is no longer just a part of his body, rather now, meaning presently, after God created her – she is fully and completely of him and from him from the inside out. Saying bone of my bones may be a hint to the inside, and flesh of my flesh could be a hint to the outside (from the inside out). Notice also Adam’s use of the word my twice which not only shows unity but could he be speaking as if he now has a responsibility to her and for her because she is now a permanent part of his life? She shall be called Woman, because she was taken out of Man. Although I have referred to the Woman as Eve several times throughout this lesson, she does not actually take on that name until Genesis 3:20. I referenced her as Eve for familiarity purposes. Here, we see Adam’s first response was to call her Woman. She was a part of man, but different from man. Some like to say that she was the feminine side of mankind. Regardless of what one thinks, one thing of note is that both the words Man and Woman are capitalized. At this time their proper names weren’t being used by each other, therefore the need for capitalization of their human titles. Notice also the emphasis placed on the phrase she was taken out of man (compare 1 Timothy 2:13; 1 Corinthians 11:8). This is the reiteration of her origin as being different from Adam and all other created beings. They were from the ground, from dust – but, not her. She was a special order. She was for a purpose (compare 1 Corinthians 11:9). She had a special role that would make her one hundred percent completely compatible for Adam. She is that something good that would come and overshadow what was not good, and with this special design on her life, she was the perfect help meet for Adam. 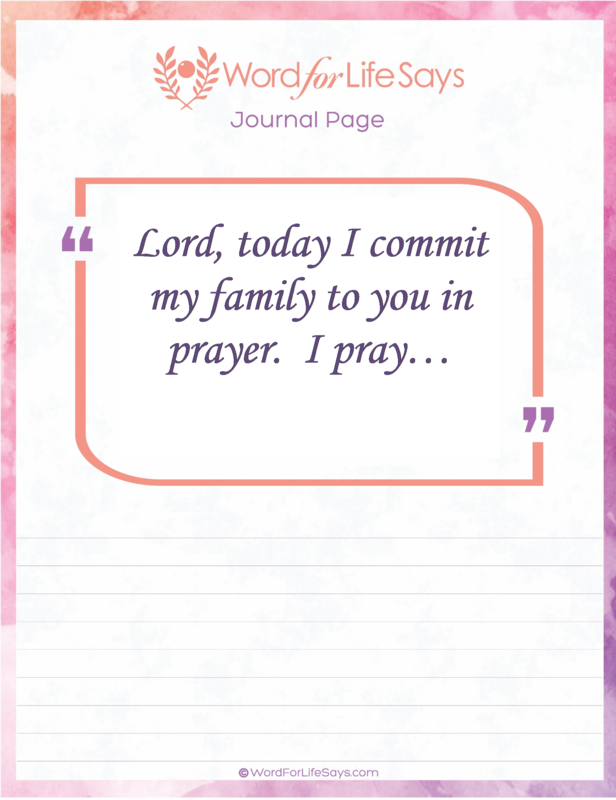 Therefore shall a man leave his father and his mother, and shall cleave unto his wife. When God looked at Adam and saw that it was not good for him to be alone, we see He remedied the situation. Now, she becomes a priority to the man. The word cleave means to “cling.” She was taken out of him and now his job is to adhere himself to her, stay with her and make himself available to her and to love her. That sounds like marriage vows already. In fact, many view this as a snapshot of what a marriage relationship should look like (compare to the Apostle Paul’s teachings in Ephesians 5:28-33). The idea of cleaving is also showing a strong level of commitment, fostering an environment where intimacy and love can be cultivated and nourished. 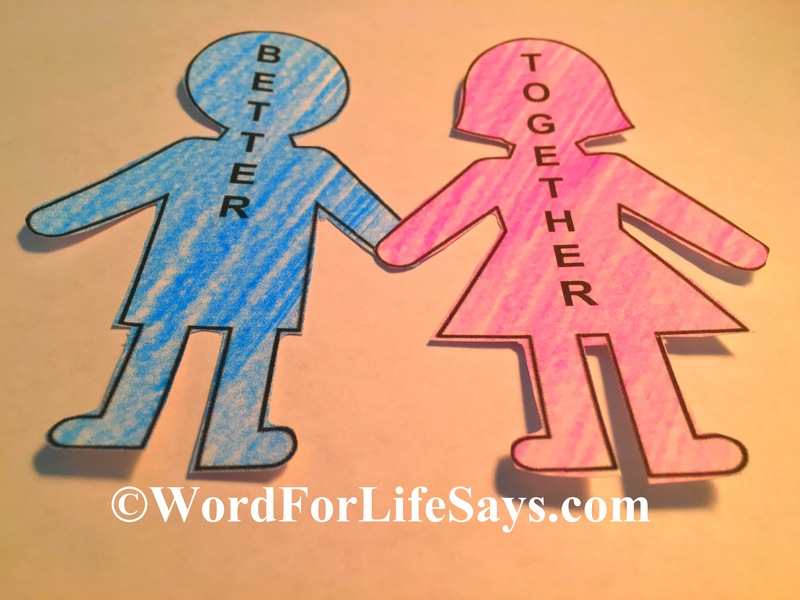 It is in this relationship where those needs that were once unmet, can now be met in this God-ordained, suitable partner for life as one flesh together (compare Matthew 19:4-6; Mark 10:6-9). Whatever brought attention to the Man’s previous “alone” state can now be fully satisfied and fulfilled with the gift of the Woman. And they were both naked, the man and his wife, and were not ashamed. When my youngest was in Pre-K, I volunteered a lot at her school. Her teacher was very thorough in all areas of subject, but had a deep appreciation and interest in art. One of my assignments with the students was to go through an art catalog and show different works to the students (they had a field trip coming up to the museum). I was to point out and ask about lines, shading, shapes, and such in the works. Before releasing me to the students she made sure to emphasize the need to stay away from “inappropriate” works, namely naked works, and with good reason. The time of Eden is over, and these types of materials are usually looked upon with a certain amount of shame. A quick search on the internet and in books telling the story of Adam and Eve will hide their nakedness behind trees and leaves, or something else. But, in our lesson, innocence abounded, and they were both naked… and were not ashamed.” During this period, there was nothing present that could make them feel ashamed. There was no sin and no wrong. They were completely pure. The need to cover came immediately after they sinned (see Genesis 3:6-7). As soon as their “eyes were opened… they knew they were naked.” But here, as God originally made them, they had no reason to be ashamed. 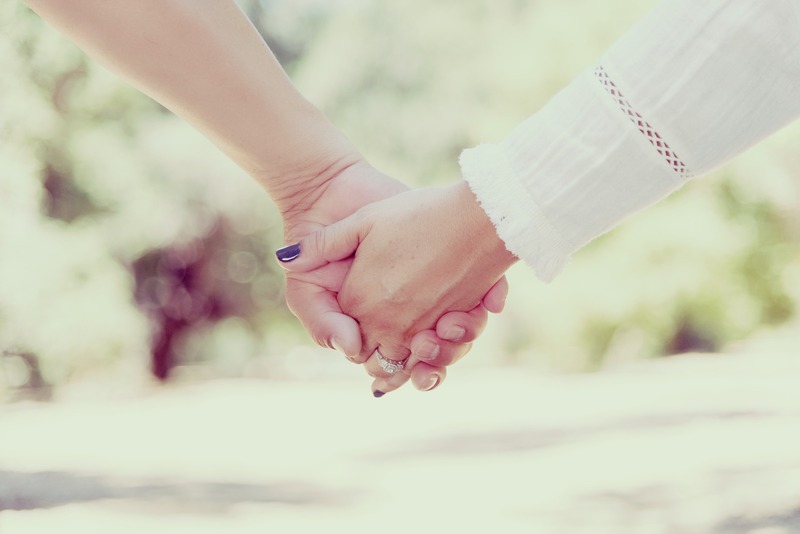 Adam and Even could enjoy an unhindered relationship God blessed them with to meet the capacity of human need. In Eve, the help meet God designed for Adam, the void that was once present could now be filled. 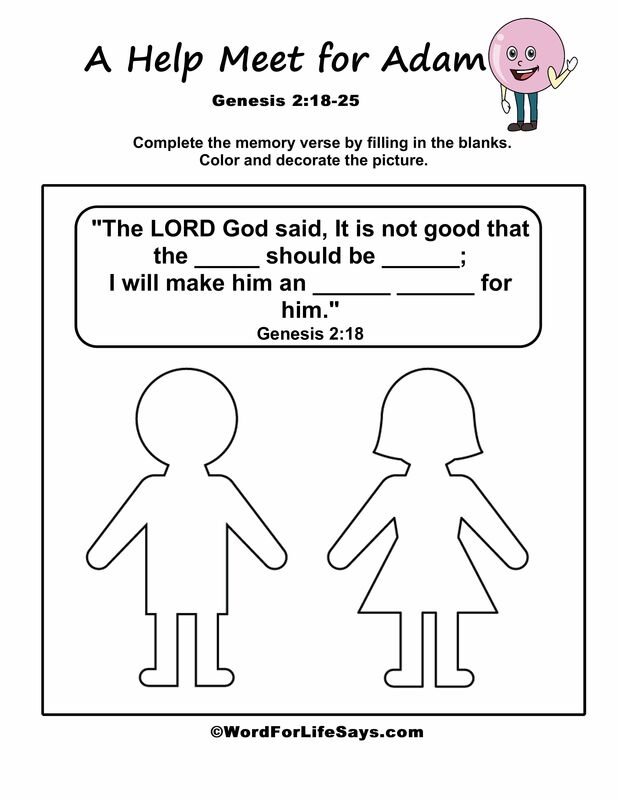 Better Together Craft: Using the Better Together Craft pdf template, create this craft following the directions as a reminder of God’s great design.